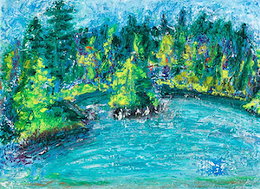 Violet Rosengarten's spring collection is described by the gallery as "radiant plein air paintings with vibrant colours and interesting textures." "There’s a thrill to painting on site in Nova Scotia! I find it exhilarating to paint rapidly in order to capture the moving clouds, the sudden changes in light and colour, the shifting tides, the wind. I paint the feeling of the place," her artist's statement adds.